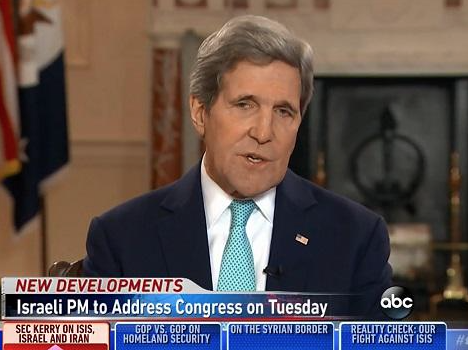 Secretary of State John Kerry touted the US’ relationship with Israel, arguing “we have a closer relationship with Israel right now, in terms of security, than at anytime in history” on Sunday’s “This Week” on ABC. “We have a closer relationship with Israel right now, in terms of security, than at anytime in history. I was reviewing the record the other day. We have intervened on Israel’s behalf in the last two years, more than several hundred, a couple of hundred times, in over 75 different different fora in order to protect Israel. I talk to the prime minister regularly, including yesterday. We are not — we don’t want to see this [Netanyahu’s speech before Congress] turned into some great political football. Obviously, it was odd, if not unique that we learned of it from the Speaker of the House and the administration was not included in this process. But the administration is not seeking to politicize this. We want to recognize the main goal here is to prevent Iran from getting a nuclear weapon, and on that, Israel and the United States agree” he stated.